Waters of the Dancing Sky Scenic Byway – Stretches 191 miles across the far north/northwest portion of Minnesota. State parks along the route include Lake Bronson on the western end, Hayes Lake, Zippel Bay and Franz Jevne. As the routes name suggests, this far northern byway offers nighttime visitors an excellent chance of seeing the magnificent Aurora Borealis, better known as Northern Lights. 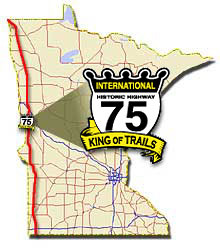 Stretching from the Gulf of Mexico and north to Canada, Highway 75 was dubbed the King of Trails 90 years ago. The Minnesota portion, King of Trails Scenic Byway, stretches 414 miles along the western border. One of the attractions of this byway is the lack of tourist spots. The byway travels through small farming communities, expansive grain fields, wide grasslands, and picturesque state parks. This group has a wonderful web site at www.mnbirdtrail.com that you must check out. It contains birding information, maps, and contact information. The trail goes from Warroad to Greenbush on Hwy 11 then south on Hwy 59 to Fergus Falls, Minnesota. From Greenbush to Baudette across the north part of Minnesota along Highway 11. This route is a smaller section of the Waters of the Dancing Sky Scenic Byway. 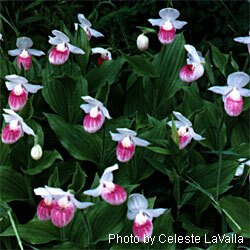 This route features Minnesota’s protected state flower the Lady Slipper. It complements other efforts including the National Prairie Passage Route listed below. Minnesota, in partnership with five other states, has developed a corridor of roads called “Prairie Passage” to protect and restore remnants of prairie, and to draw today’s travelers to explore this natural heritage at prairie sites along the route. In Minnesota, the 600-mile Prairie Passage route meanders down the western side of the state, from Hallock to Luverne, and along I-90 in the far south between Luverne and Albert Lea. For centuries Native peoples and the “Coureur des Bois” paddled the historic boundary waters of this east-west route joining Lake Superior to the western prairies. Today you can explore the beauty and wonder of the original route on good roads linking southeasternManitoba, northern Minnesota, and northwestern Ontario with Lake Superior. Consists of over 400 miles of paved roads (Highways 11 and 12) in two countries. Includes the city of Warroad in Northwest Minnesota as well as Baudette, Winnipeg, Thunder Bay, Rainy River, Steinbach, Sprague, Fort Frances and Atikokan.